Skybet is one of the leading bookmakers in the UK. They have built their position through the Sky television but were recently bought by the CVC Group. The company includes following brands Sky Bet, Sky Vegas, Sky Casino, Sky Poker and Sky Bingo. Sky is also the owner of Oddschecker, which gives this brand a great way to attract new customers through this odds comparison website. A great and simple welcome offer from SkyBet. You now can get £10 completely free. It's enough to open a new account with this bookmaker. Once account is verified you will receive a £10 free bet. No deposit required. It's a great offer for all punters who want to start betting without putting own funds. On top of this no deposit offer SkyBet is offering a wide range of other promotions. You can for example get a nice boost when you cash out your bets. Additional £5 free bets every week are waiting for you when you join the SkyBet Club! By joining Skybet, you can get £5 Free every week as a member of the Free Bet Club. To qualify, you must place a bet of £25 on any sport at odds of evens or better before midnight on Sunday. You will then be credited with a £5 free bet by 7pm Monday to use on any sport of your choice. Be careful though! If you miss a week you must place a £40 bet to re-join the Club. Full terms and conditions are available on the site. There are also continually updated offers on a variety of sports known as “Price Boosts”. These are advertised prominently on the main page and usually apply to the biggest up-coming races or sports events. If you take an early price with Skybet and the Starting Price is bigger, Skybet will pay out at the longer odds. This means that you can take the price safe in the knowledge that you will always get the best industry price. This offer applies to all win and each-way bets on all UK and Irish races, every day of the week! There are also frequent enhanced place terms on big races, such as paying down to fifth place or paying out at 1/4 odds instead of 1/5 odds. There are frequent “Price Boosts” on the big Soccer matches, typically offering a larger price on the first goalscorer markets for the most popular players. 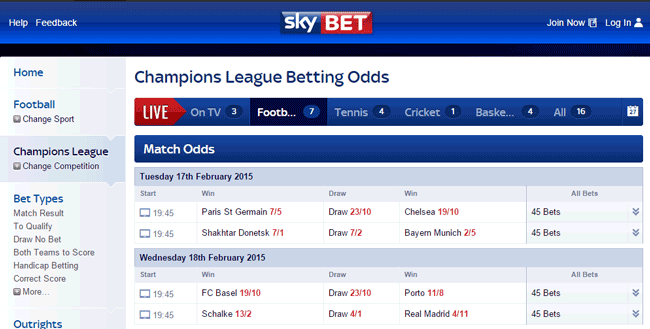 The boosts are highlighted to the right-hand side of the current odds list on the main football page. Skybet also offer enhanced odds on accumulators. For example, if you fancy the top four Premiership teams to win on Saturday, Skybet may offer a special enhanced price that pays more than the standard accumulator at the advertised odds. Skybet provides live betting on a wide range of sports events including football, horse racing, golf, cricket, tennis, rugby and speedway. Prices are available for Fixed odds and Handicap betting. These can be displayed in fraction or decimal odds formats which you can determine by your “Account Settings” tab. As you would expect from Sky, the website is bold, bright and attractive. The site is geared towards the top sports of Football and Horse Racing which are highlighted at the top left of the main page menu. There are also quick links to the Premier League matches, Super League, NFL and other top events. Below this you will find a complete A to Z of the available sports followed by links to special offers and Skybet’s sister sites. The main events of the day are listed in the central panel with quick links to your horse racing form, betting calculator and help and support. If you are a regular user of sportinglife.com, you will be very familiar with their excellent horse racing form coverage. Your registration with Skybet automatically provides you with free access to their vast video library. Almost all previous races can be viewed either in full or for the closing stages only. This is an invaluable tool for the horse racing punter and we strongly recommend it. For football fans, the easy-to-follow layout of the site enables you to access the latest odds for the Premiership or domestic leagues as well as Champions League and International fixtures. For a stake of just £1, you will also be able to watch your chosen horse race or sports event live on site. Deposits and withdrawals can be made by all of the most popular methods including Visa, Mastercard, Skrill/MoneyBookers, Neteller and PayPal. All withdrawals are free of charge and the minimum withdrawal is £10. What we really loved was the fact, that someone was finally brave enough to place the betting slip into another place and to us, this one makes perfectly sense! 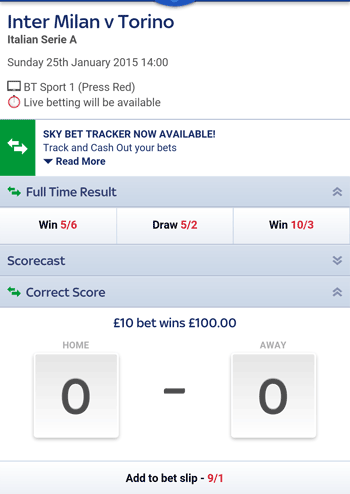 Skybet customers can also bet on their mobile, through their TV or over the telephone. You can download the mobile app via the link on the left-hand side of the main page. Being part of the Sky Sports mobile group, you can also access a range of news, views and video applications. This deserves an own part! SkyBet now offers what they call a Sky Bet Tracket. This app gives you the possibility to track all your bets including live stats AND it also shows you if yan go for an early cashout and if, what the conditions would be. This is a feature we saw from some German bookmakers and it seems that it is now also coming to UK. It gives the player a way to cash out in case he gets nervous or simply loses his faith in to a bet he placed prior. Once your bet is available for an earyl cash out, you will see the offeres pricing. Skybet are relative newcomers to the bookmaking world but have already made a big impression. Their close links with television makes them a firm favourite with football fans for direct access for betting on live games. Although the sign-up bonus is not particularly enticing, the chance to earn free £5 bets throughout the season could be worth a lot more to the regular punter. The site is well designed and easy to navigate. They may not be the most exciting in the business in terms of headline bonuses or value prices but they are a good, steady and reliable sports book that should certainly be a welcome addition to your betting portfolio. Skybet have 24/7 customer service available through their live chat facility. They also pride themselves on a very fast response time for email. If you prefer to talk on the telephone, their lines are open from 8am to midnight every day.